OK. This blog entry has been in my 'Draft' section for the LONGEST time! >.<" Gomenasai! 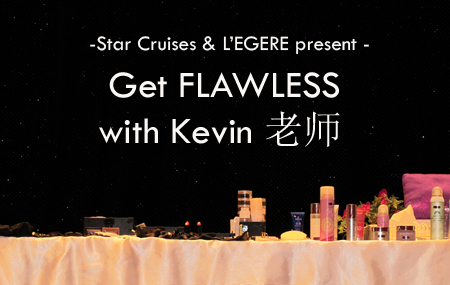 I wanted to do a proper blog entry for this as I know many are super curious to know what Kevin 老师 has shared with us his beauty secrets during this seminar. Apologises for the wait people! AND THE WAIT IS OVER!!! A display some of L'EGERE star products! Very egg-cited me!!! Wearing MIT makeup from my previous TPE trip! Hehe! Kevin 老师 introducing some of his favourite L'EGERE products to All! Kevin 老师 was super humorous and friendly! :) He was trying to share as much skincare / makeup tips with us as possible during the 2-hour seminar. Don't say I never share with you guys okay?! Prepare to jot down plenty of notes people!!! ☠ Formation of Pimples/Acne (青春痘) = Dehydrated skin which resulted over production of oil sebum. "干到过油!" as what Kevin 老师 mentioned. HYDRATE YOUR SKIN WITH PLAIN WATER!!! See, SO SIMPLE & EASY STEP right? All of us (male/female) should really drink up to 1.5litres of water to keep ourselves hydrated and to flush out any toxins in our body, which will gradually promote our inner health and appearance. Make sense right? Aside from normal face wash, Kevin 老师 has also reminded us the importance to scrub to remove dead skin cells to promote radiance on our face! ✏ Scrub once - twice a week. ✏ Apply Toner/Makeup Remover FIRST before scrub. ✎ PAT the toner UPWARDS along your face. YES - the direction should be AGAINST your facial pores! Why? This is to have a better thorough removal of any dirt/sebum stuck on your face. And by patting; this gentle motion will help to effectively remove the dead skin cells as well as dirt/sebum. *Skincare guilt confession* I'm too lazy to pat actually. I just do a circular upward motion instead. :X HAHA! Kevin 老师 demonstrating his favourite L'EGERE products onto 1 of the Audience. SEE - it's not just women have the privilege of looking good - MEN TOO! Also, he was teaching us the correct way to maximising the effect onto our skin at the quickest time by apply generous amount toner/enhancer onto the cotton pad within the 3-fingers width. LOL! Kevin 老师 demonstrating L'EGERE Toner which can form into ice strip! So remember folks! Not to apply directly onto your face with the product! Always spray onto the cotton pad first!!! 1 thing I ❤ about this seminar - Kevin 老师 really make the effort to interact with ALL the audience! LOL!!! NO THIS IS SERIOUS! Kevin 老师 really did suggested to lay the head against the edge of our bed when applying skincare products! This is against the gravity force of pulling our face downwards and prevent sagging. HAHA! Aside from teaching us the useful skincare tips, Kevin 老师 also shared with us some of the dress-up skills as well! PS: He is also a fashion stylist who gives the latest fashion trends happening in both Europe & Asia. Kevin 老师 showing us his Top 3 Skincare favourites from L'EGERE!!! ❤ *LOL* Stare at your naked body so that you can understand your body better! ❤ LOVE yourself - love the way you are! I BET YOU GUYS ARE ALSO WONDERING WHAT DOES KEVIN 老师 BRING ALONG WITH HIM FOR ANY MAKEUP SHOWS RIGHT?! TADAH~!!!! 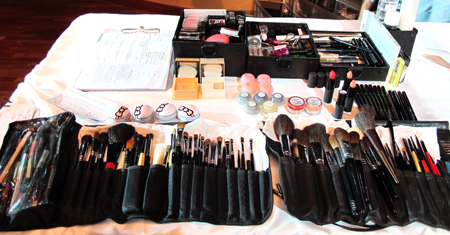 THESE are all Kevin 老师 makeup tools & wonders!!! OMG!!! And how can I miss out the golden opportunity to take pic with my Holy-Papa of Makeup and ask him to sign all my makeup bibles authored by him?! LOL!!! ✿◕ ‿ ◕✿ YEAH!! 1 of my wishes come true!! WOOHOO! Of course, how can I not own any of the products after hearing so much goodies about L'EGERE?! And YES, I PAID FOR IT! Instead of using cotton pad, I pour the product onto my hands (2-3 drops) for direct application onto my skin every night. It absorbs into my skin very quickly! My skin does look more supple after application! Note: This is before applying any other serum/mask! Nope - my face does not feel oily even until next day! I'm certainly looking forward to try out the rest of the L'EGERE products and you should too! They are available in major WATSONS/ Guardian outlets.